I was looking at clothes online the other day and one of the websites mentioned getting ahead on fall styles. While fall is my favorite season, I don't want to get rid of summer just yet. With the surgery on my legs in May, I was not able to enjoy summer like usual. I also had surgery in June of last year, so last summer was out, too. Now that I am able to walk around, it is time to make the most out of these last few weeks. This drink will help you do just that. 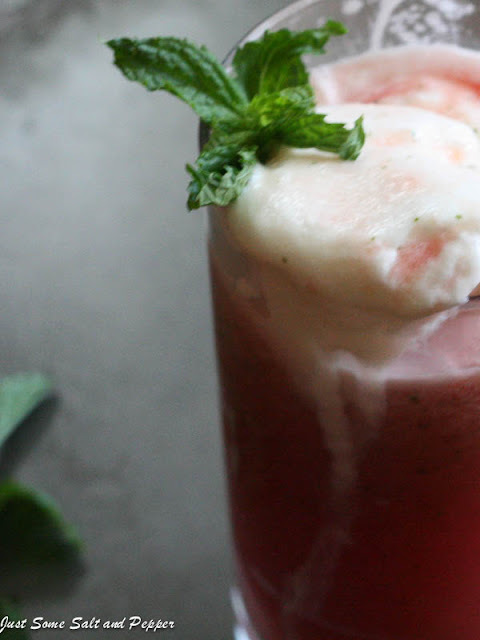 It's full of summer flavors - the cool mint, the refreshing watermelon, and the ice cream, just for good measure. I think you should try to make this drink as much as possible between now and Labor Day. 1. In a blender, combine watermelon, mint and soda water. 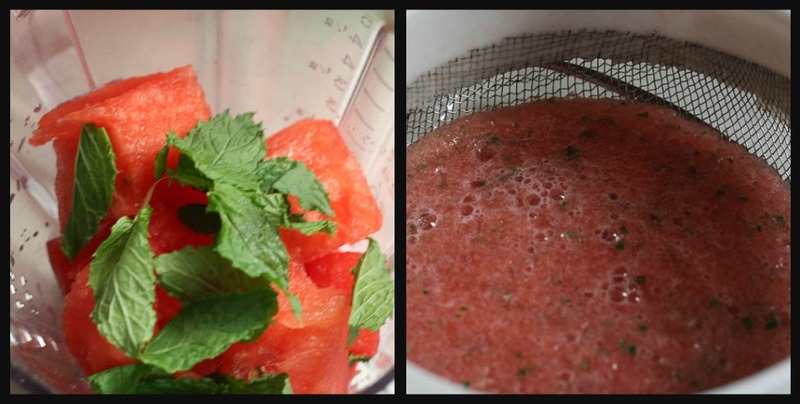 Blend until the watermelon is broken down and mixture becomes smooth, about 30 seconds. 2. 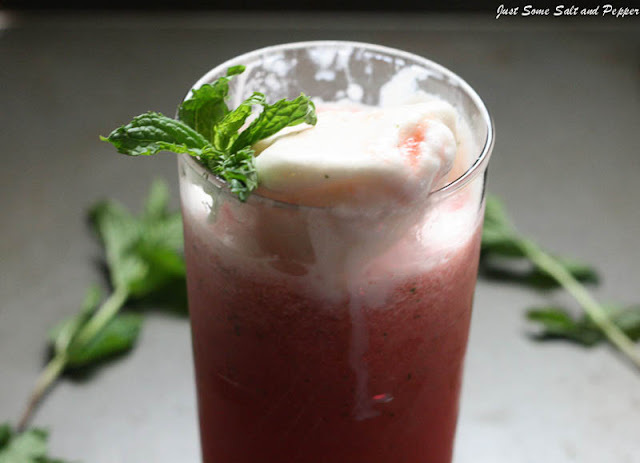 To assemble floats, scoop 1/2 cup of ice cream into a a tall glass and top with 1/2 of watermelon mixture. What a delicious and refreshing drink! I never mixed watermelon with ice cream - so unique! I wish I had one right this very minute. With a HUGE watermelon in my fridge...these are happening!! Have fun enjoying the rest of your summer!! Until I started cooking, I had no idea why people added salt to fruit. Now it just makes so much sense, and does a lot to bring out the flavours—I've never thought of making the combination in a soda float, though! Great idea :) Sounds perfectly refreshing for the end of summer. Watermelon is one of my favorite summer fruits, your recipe looks so good! Refreshing is an understatement here! I love watermelons and this drink is perfect! Oh my word this is genius. Ice cream and watermelon is something I've wanted to try but wants sure if it would be good. Wow, does it look amazing! Pinned! what an amazing recipe! 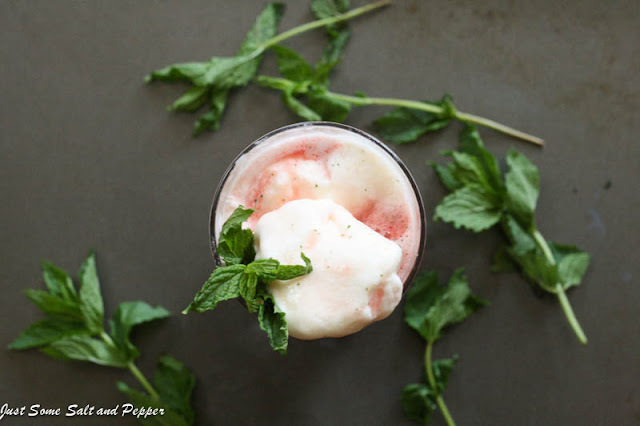 i can't wait to try it...mint and watermelon is great together, but with ice cream? wow!